As weather abates will Natural Gas respond? I’ve pointed this out several times in recent weeks but a sleeping giant was awoken 9 weeks ago. Natural gas has been on a tear from early November adding $1 move in the futures market from the first week of November until peaking in Mid-December just above $4.50. In the last two weeks February has started to retreat losing 8% currently trading just above the 38.2% Fibonacci levels. We have seen record draws and while I don’t expect injections in the coming weeks with the latest Arctic spell that blanketed the Midwest and Northeast it is possible nat gas futures over reacted. Frigid temps have boosted the usage of this fuel that is used by nearly half of US households as their primary heating source but the forecast is for higher temps moving forward. There are some prognostications forecasting a record draw in supplies next week but there is obviously jockeying for position evident by the recent depreciation. We are seeing technical signs of an interim top with futures flirting with breaking previous support . 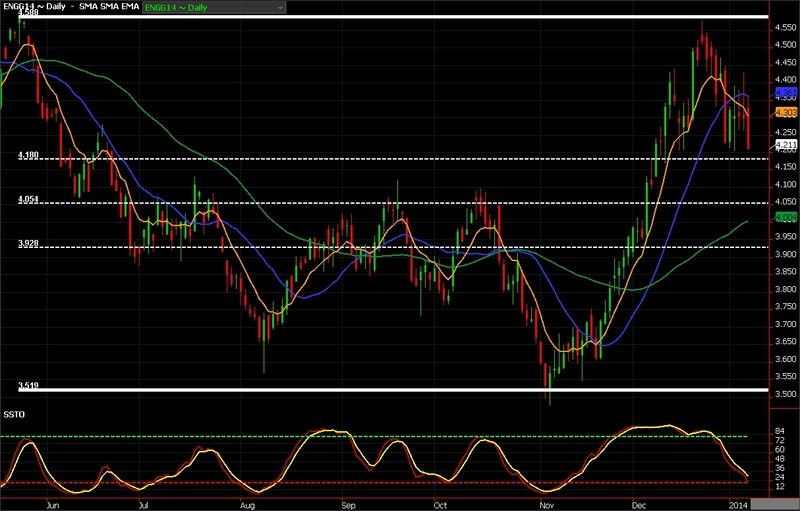 On a breach of $4.18 in February futures I expect a trade to the 50 day MA (green line) currently at $4.00. As we approach milder temperatures and we see a reduction in seasonal demand I anticipate seeing pressure in the next 2 months. My suggestion is to work into the trade because we could see spikes in the coming weeks. Buy March $4 puts for $1250. 49 days until expiration with a current delta of 35%. On a spike in the next week look to establish a calendar spread…selling nearby and buying forward contracts. I like buying February 15′ and selling February 14′. Current trade is 16 cents premium to 15′. Look to get in closer to even money. On a spike higher we should see this spread narrow and then as prices abate if they abate this spread should widen. For a more in depth view of spreads check out a recent blurb by Bradbard in Futures Magazine on-line.